Also, I love the idea of vlogging my days with the girls. But, most of the time, I just can’t find the time and energy to do it!! Picking up the camera at the right moments, then editing it all in to a pristine video after, takes time. Snapchat can form a vlog of your day without the need for editing. In a ‘snap’, you can either take an image or record a ten second video. And, if you need more than 10 seconds, you just record another snap straight after! You can then add these snaps to your story, where they stay for 24 hours. Your stories are viewed by those who add you as a friend on Snapchat. Another great thing about the platform is that it’s not about having vast numbers of followers. No one can see how many people are following you. And, as snaps are removed after 24 hours, you really start at the same point as someone who’s been using it for months. You don’t have to work hard to build up your profile with updates. All conversations on Snapchat work in the same way, in that snaps sent directly to others only last 24 hours. You can also save your snap story, so you can create a video of your day to keep! I follow a lot of bloggers on there now, and it has definitely helped me increase my relationship with other bloggers and get a deeper insight in to their lives that their blog might not necessarily give. I’d really urge you to give it a go! But, when you first sign up, it can be a bit scary!! 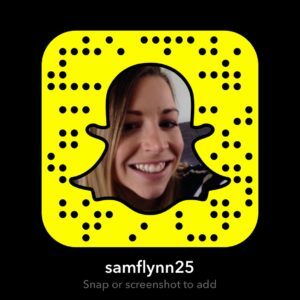 I wrote this beginner’s guide for my social media blog, and thought I would copy over the points on to here for any bloggers looking to get started on Snapchat. I might carry on the series with a second post on Snapchat ideas and ways to use it! But first, you need to get started!!!! Go to your app store, and download Snapchat. I also run Snapchat on my iPad, but had to search iPhone only apps to do this, as there isn’t actually a Snapchat for iPad app. Snapchat is available on iOS and Android. Go through the sign up process on the app. When creating a username, this has to be unique and not used by any other Snapchat users. Try to be consistent with your other social channels if you can (unlike me who stupidly went for one that wasn’t the same back when I joined!! I’m samflynn25 on there). As well as your username, you will have a snapcode. This is a ghost symbol surrounded by a yellow background with black spots. This is like your own personal Snapchat barcode! People can use this to add you via your snapcode (more on this later!). To get to your snapcode, swipe down from the screen used to take snaps. To add a selfie to your snapcode, click your snapcode, line your face up in the ghost and press the capture button! This will take 5 shots consecutively, so you can pull five different faces! The share button in the top right hand corner allows you to share your snapcode and save it to your phone. When you add friends, you will be able to see the snaps they share to their story. You can also send them snaps directly if they add you back. Again, swipe down from the screen used for taking snaps. Then choose ‘add friends’. You have a few options. First is to add my username, which means knowing the username of the person you want to add. Secondly, you can add from address book. This will go through your contact list and let you know who is on Snapchat. Thirdly, you can add by snapcode. If you find someone you want to add on Snapchat and they have shared their snapcode, you can take a picture of their code, or take a screen shot. When you choose ‘Add by Snapcode’ it will access your pictures, you select the image of the code, and Snapchat will then scan it. Clever stuff!! Fourthly, you can add nearby. A friend must open ‘add nearby’ at the same time in order to do this. Good for if you’re physically with someone you want to add on Snapchatt. If you’re wondering where to start with finding people to add, a simple option is to run a search on Twitter for ‘snapchat’ and filter it by those you follow. You’re already following them on Twitter, so you’d probably be interested in their snaps too! 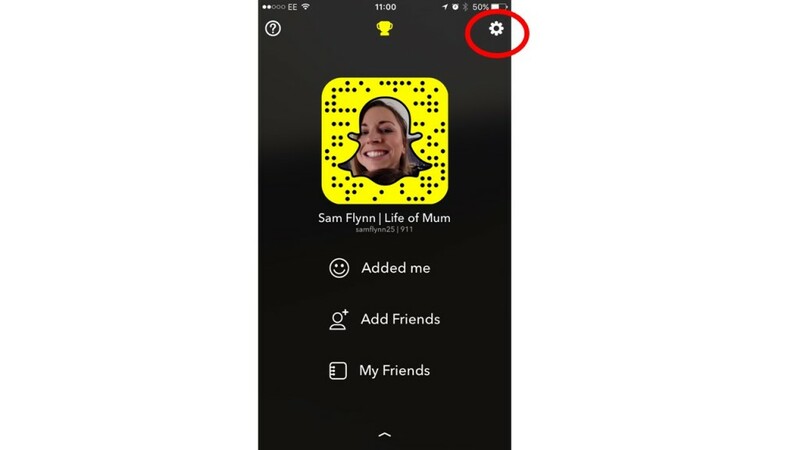 If you want to adjust any of your settings on Snapchat, you can access these by swiping down from the snap screen, as you did to add friends, then clicking the settings icon in the top right hand corner. And now the fun can begin!! When you open the app, you will be taken to the snap screen for you to start creating snaps. You have a few options on that screen. You can turn the camera to either be outward facing or front (selfie) facing, by pressing the little face with arrows icon in the top right corner. You can also do this by double tapping the screen. You can choose to turn on or off the flash in the top left corner. By tapping the circle in the bottom centre, you take a picture. By holding this circle down, you have ten seconds to record a video. 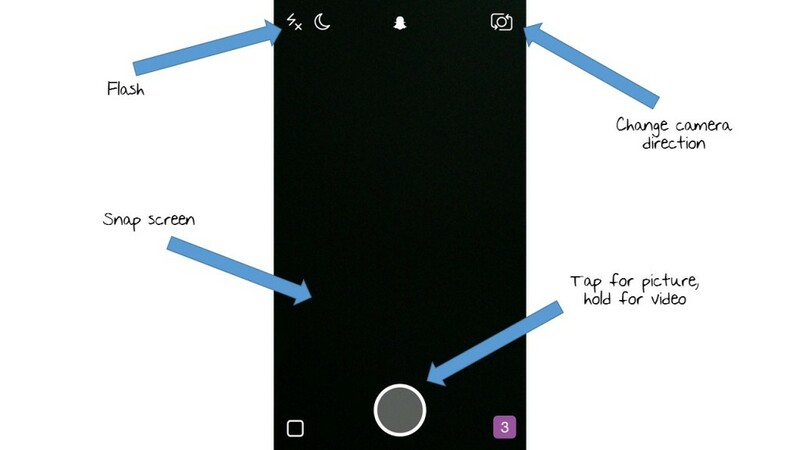 Once you have taken your snap, you can add filters to it by swiping left or right on that snap. Filters include time, temperature, speed, geofilters of your location, black and white and other colour altering filters. You can also choose to add text if you wish. Tapping the ‘T’ symbol once will give you a line on which to add text. Tapping it twice will allow you to write text in different colours, and use your two fingers to zoom the text in and out to make it smaller or bigger. Tapping the ‘T’ a third time will put this coloured text in the centre of your snap. The world is emoji mad at the moment isn’t it!! And Snapchat is no different. By tapping the notepad symbol in the top right corner, you are given all the standard emojis. Once you’ve chosen your emoji, you can increase and decrease its size using your two fingers to zoom it in or out. You can add as many emojis as you wish. 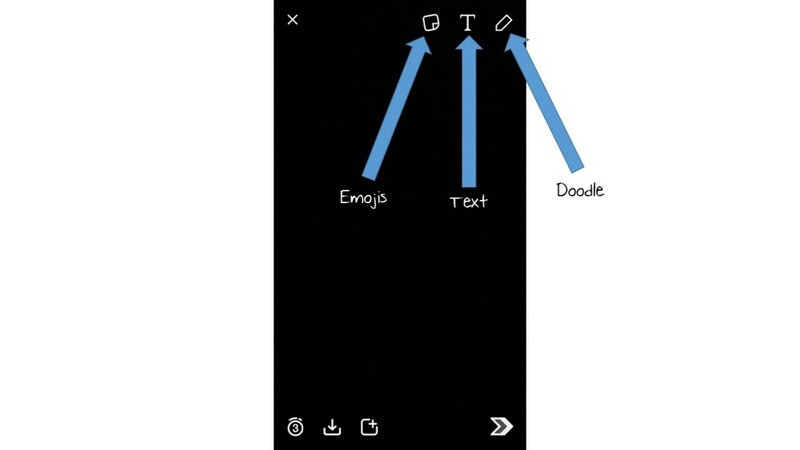 Tapping the pencil symbol will allow you to doodle on your snap in different colours. You could add circles round something you want to point out, or arrows. You could write (though my handwriting looks terrible when I attempt this!!). You could shade in the background of your text. This is your chance to be creative!!! To make your snaps a bit more crazy, you can add filters to your face before you take a snap when in selfie mode, or on others’ faces in outward facing camera mode. To do this, focus the camera on your face, and press and hold the screen on your face. Hold until a white frame goes over your face. You should then be presented with different face filters for you to choose from. These change daily. You could be a dog, have flowers in your hair, have a full face of make up, have a distorted face, or any other weird and wonderful filter that is available that day! You then take your snap as normal, either as a picture or video. Once you’ve created your snap, you can then add it to your story. This can be viewed by those who have added you on Snapchat. To add to your story, click the square with the plus sign in, in the bottom left hand corner of your snap. You can also choose to save your snap by clicking the save icon in the centre of the three icons in the bottom left of the snap. Picture snaps are viewable in the flow of your story for however long you set out in the timer button in the bottom left. If you have lots of text, make it longer, if no text, keep it short! 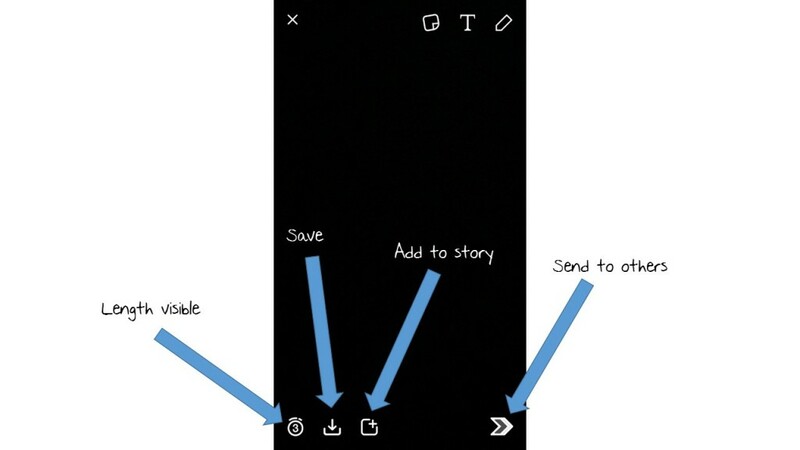 You also have the option to send your snap directly to someone, rather than adding it to your story. They must have added you back for you to be able to do this. Click the arrow in the bottom right of your snap, and choose who you wish to send it to. They will still only have 24 hours to view that snap. If you swipe from right to left on your snap screen, you will be taken to stories, where you can view the stories of those you have added on Snapchat. When viewing a story, you can tap the screen to move on to the next snap in the story. You can also swipe from right to left to move on to the next person’s story. You’ll also be able to open up your story and see how many people have viewed each individual snap in your story, and who those people are. 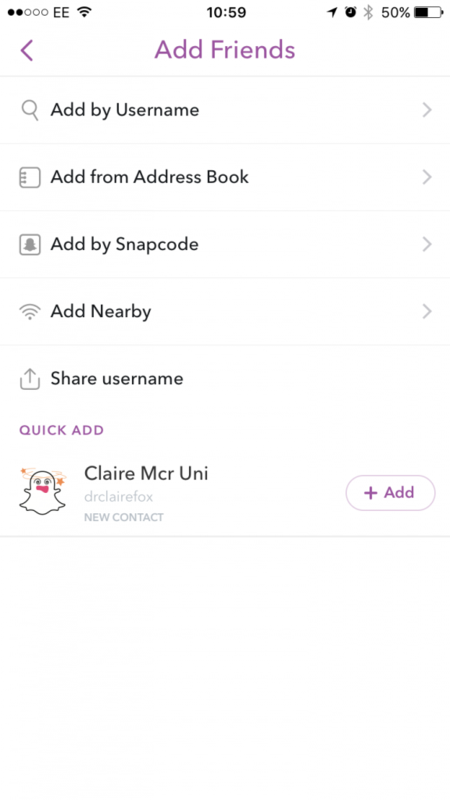 If they have added you on Snapchat (or alternatively have made themselves public so that anyone can chat with them), you will able to chat with people from their snaps. You can click the chat button at the bottom centre of the snap to send someone a message about that snap. Be warned, if you make it so that anyone can chat with you in your settings, you may be sent some ‘interesting’ pictures!!!! You can also swipe from left to right to access the chat area. This will allow you to send a chat to someone. 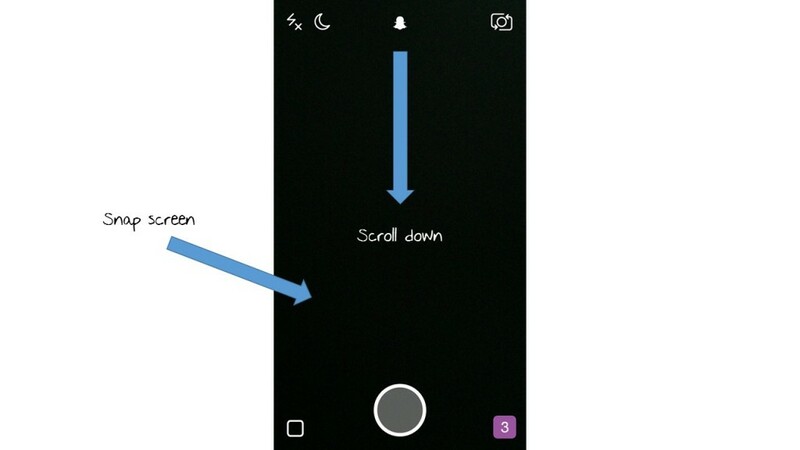 Choosing the message symbol in the top left hand corner allows you to create a snap as usual for that person, or you can send them a saved image, ring them, have a video conversation or send them different snap memes. And that’s it! I know, I know, it does seem like there’s a lot to it, and a lot of swiping here and there. But, once you get the hang of it, the swiping around becomes pretty easy. 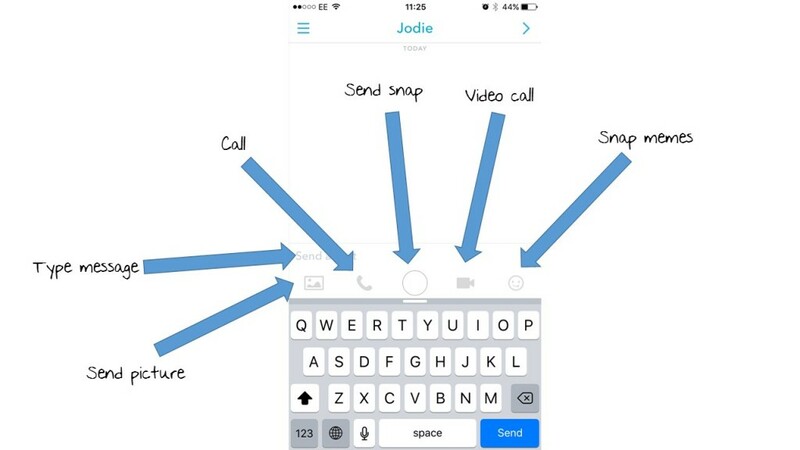 And keep coming back to this guide to refer to and get your head around using Snapchat! 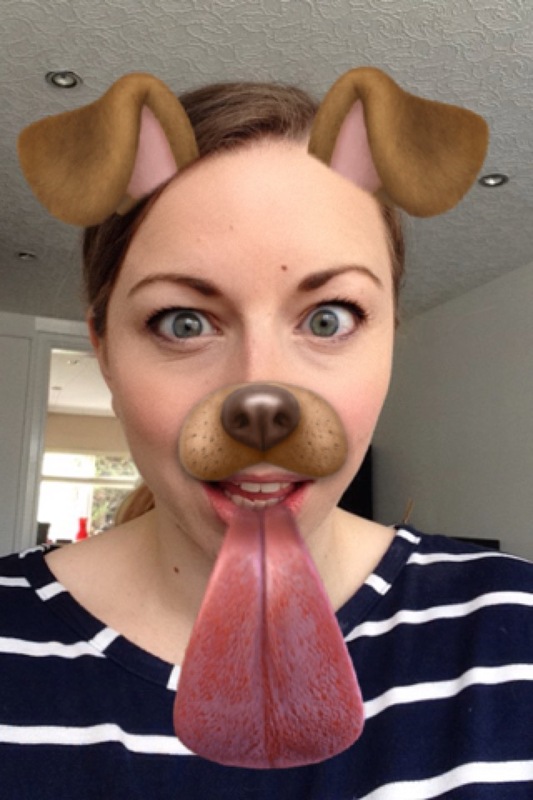 I’d also recommend just having a go and creating some snaps before you put yourself out there and start adding people. Or you could just start by following others and see what they post. Make sure you follow me!!! I’m samflynn25!